This book doesn’t stray too far from some of the other plot lines in the series. Kitty is the only one who can save innocent people from being ravaged by X (in this case army soldiers turned into werewolves) but this time she’s got help from Ben and Cormac. And she’s being sued for libel by the owner of a convenience store chain that seems to be a magnet for the supernatural. I was hoping this would be related to whatever the vampires have brewing but they take a backseat in this story. The alpha in the soldiers’ unit is dead and they find it difficult to adjust. They break out of their treatment facility and Kitty tries to bring them to a point where they can try to balance their wolf and human selves. In summary, Kitty saves the day, the lawsuit is handled and we’re given a new piece of information about Cormac’s time in prison that’s sure to be needed in the other books in the series. It was well written but seemed formulaic to me. At least two more Kitty Norville books are on the way. Vaughn included her writing playlist so you can get into the mood of the novel while reading it yourself. Paul Simon, “Late in the Evening. In the newest installment of the Kitty Norville series, Kitty and some of her paranormal friends are talked into doing a reality show. A few strangers are thrown into the mix and one skeptic. They’re at a remote lodge with several production people. For a few days it seems to be on the level. They’re asked to stick around the lodge as much as possible and are taped having a discussion each evening. They stumble across a campsite and wonder if something more is happening when the cabin loses power and the one phone to the outside world goes missing. Dead bodies begin to pile up and they must fight for their lives. Mostly independent, it’s going to take compromise and teamwork to live. It’s not important to have read the other books in the series but I think it would help before tackling this one. Vaughn is adept at putting Kitty into situations that force her to use all of her (werewolf and human) instincts and this is no exception. This is one time when no one from her pack can help her. Ben is sharp but he’s not near Kitty and he’s distracted with Cormac’s impending prison release. It’s going to take him a day or to before he figures out she’s in danger. The ending felt like… an ending. There’s something final about it and until I read the next novel would be released in July, I wasn’t sure the series was going to continue. The next novel is named Kitty Goes to War. Combined with the ending of this book I think Kitty’s House of Horrors was a setup to launch Kitty getting heavily involved in the vampire’s Long Game. Early last year I participated in a blog tour for Carrie Vaughn centered around the Kitty Norville series. The last book, Kitty Raises Hell, had an excerpt in it for Kitty’s House of Horrors. In this book, Kitty participates in a reality tv show which isn’t turning out to be the experience Kitty thought it would be. As the bodies pile up she has to figure out who is behind the murders and who to trust. This time it sounds like she can’t rely on anyone in her pack to help her. Congratulations to Kelly B for winning the first four Kitty Norville books by Carrie Vaughn!! I noticed the entries were fewer for this giveaway and I think it’s because (1) a lot of people were giving away books as part of Carrie’s blog tour and (2) I wanted to make it fun by having everyone do a little bit more than just leave a comment so an entry required a little more thought than usual. Kitty does get started on writing a memoir during Kitty Takes a Holiday. Surprisingly, it does get finished and published. The events in the Kitty Norville books take place fairly close together so doing a book tour would definitely give Kitty a reason to do some traveling. And she could ask answer some of those questions in person. Rhonda’s question of “How do you feel about the way werewolves are portrayed in recent urban fantasy novels such as NEED or the Mercy Thompson novels?” would definitely appeal to the former English major in Kitty. In fact, she’d probably devote an entire show to it. Cheryl S. brought up a good point with “I would ask her what are her favorite foods. Do werewolves eat differently than humans when in human form?” In the novels Kitty eats a lot of rare steaks. But she also drinks wine. Where is the junk food and chocolate? Lisa Damian said, “I would ask her opinion about this frustrating ability I have to make everything technological around me go wonky.” You are not alone. I know someone who has this ability… computers, speakers, watches and lights are the main things that behave abnormally in his presence. These questions are so good I’m going to pass them along to the Hachette Book Group to pass along to Carrie. Kitty knows something from Las Vegas has followed her home to Denver. It smells of brimstone, uses fire and seems to have hands although she can’t see them. This apparent demon begins widening its circle of destruction from Kitty to her pack and eventually the streets of Denver. Along the way, Kitty becomes involved with the paranormal investigators from the reality tv show Paradox PI, has the younger brother of her best friend TJ show up on her doorstep with a lot of uncomfortable questions and has a mysterious vampire appear who claims to be able to rid Denver of the demon. The vampire’s price is free passage in Denver which immediately gives Rick, Denver’s Master vampire, pause. This book is likely one of the first of many showdowns Kitty will experience during The Long Game. Because vampires live for so long they make strategic decisions that will place themselves where they want to be in hundreds of years. They have all the time in the world while other supernatural beings have less time. With each adventure that befalls her, Kitty is gathering recruits for a great battle and she probably doesn’t even realize it. Heck, Carrie Vaughn may not completely realize it yet but I suspect she does. 🙂 This is one author who has her act together. One of thing I admire about Kitty is her confidence which has grown since the series began. She has her moments of doubt but she trusts herself. Kitty’s thought processes are sound – she can recognize when a decision is based on fact or emotion but also trusts her instincts. One of those instincts is often knowing who she can trust and how far to trust them. Kitty Raises Hell provides the first chapter to Kitty’s House of Horrors, the next Kitty Norville adventure which left my mouth watering for more. I’m sure it will be worth the wait. Kitty and Ben now engaged. Like all things in Kitty’s life… nothing goes as planned. They decide to elope and have a Las Vegas wedding. Ozzie, her boss, approaches Kitty about doing a live studio show while she’s there. It’s her chance to do a tv show on her terms this time. The trip turns into a working vacation. Her mother insists on being there for the ceremony. And guess what? The hotel just so happens to host a gun enthusiast convention at the same time which might not be so bad if some of those enthusiasts didn’t make their living as werewolf hunters. The lights, crowds and sounds set the wolf sides of Kitty and Ben on edge because it dulls their senses. Vaughn gets the setting on the Las Vegas strip completely right. I was in Las Vegas two years ago for a friend’s wedding and this book brought back some good memories. Even the details about the weather at various times of day are spot on. While Ben plays poker, Kitty meets the Las Vegas Master vampire and becomes intrigued by two acts she’d like to feature on her show. The first is magician Odysseus Grant who seems to use real magic in his act. The second is the trained animal act (lions, and tigers but no wolves, oh my!) of Balthasar, King of Beasts. Kitty wants to know if the were-felines are there against their wishes or not. Odysseus and Balthasar don’t get along either which makes Kitty curious about their history. This book felt like a long setup for Kitty Raises Hell so I’m glad these two books were published a month apart. There is a lot of action in this one and it’s possibly the sexually raciest of the series. Kitty and the Dead Man’s Hand continues the theme of The Long Game which was introduced in Kitty and the Silver Bullet when Kitty learned more about vampire politics than she cared. 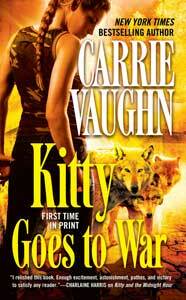 By this afternoon I’ll have reviews up for the two most recent books in Carrie Vaughn’s Kitty Norville Series – Kitty and the Dead Man’s Hand and Kitty Raises Hell. Each book in the series stands on its own. However, if you want to get started at the beginning I have a prize package to give away of the first four books in the Kitty Norville series. That’s right – Kitty and the Midnight Hour, Kitty Goes to Washington, Kitty Takes a Holiday and Kitty and the Silver Bullet can be yours! (Links go to my reviews.) These books have generously been provided by Miriam with Hachette Book Group. Kitty is a DJ who just happens to be a werewolf. She gets outed on her talk show and becomes the first celebrity werewolf. Here is a sample of the types of calls that come in during The Midnight Hour. Kitty approaches her callers with a little bit of skepticism and knows she doesn’t have all of the answers. If you called The Midnight Hour what would you ask Kitty? To get you in the mood for tomorrow with Carrie Vaughn, I have the last two playlists available from Kitty and the Dead Man’s Hand and Kitty Raises Hell. The nice thing about Carrie’s playlists are the memories some of these songs conjure up for me. One of Kitty Norville’s guiding principles is her lyncanthropy is a disease and she must live within the confines setup by human society if she’s going to be happy. The wolf side of her nature has different rules from her human side. The two sides often conflict leaving Kitty to make some hard choices. I love it. In Kitty and the Silver Bullet the one thing that can make Kitty return to Denver has happened. Her mother, who checks in with Kitty each week via telephone, is ill. Kitty tries to keep a low profile in Denver but with two of the city’s oldest vampires readying for war to determine which of them will control the city it’s not possible. She is on friendly terms with one while the other is aligned with her old pack leader. This time Kitty isn’t alone. She’s formed a two-wolf pack with Ben. Every decision she makes can impact her human family, her new pack, and the vampire war. After Kitty’s traumatic experience in Washington she decides it’s time for a vacation. As a former college English major she romanticizes being alone in a cabin to write her memoirs. The book is not coming along at all and being in the woods makes the Wolf in her want to come out more often. A bloody cross is drawn on the door of her cabin accompanied by a dead rabbit on the doorsteps. Cormac, the werewolf mercenary hunter, from the previous books shows up with Ben O’Farrell. Ben is not only the lawyer for Cormac and Kitty; Ben is Cormac’s cousin and has been attacked by a werewolf. Once again Vaughn manages to provide important information about the returning characters in the previous novels without it being boring or repetitive to readers of the series. New readers should be able to follow along without any problems. When in Denver for the Kitty and The Midnight Hour book, Kitty was one of the lower wolves in her werewolf pack. Even before becoming a rogue werewolf – one without a pack – she considered her non-lycanthrope friends part of her pack. In Kitty Takes a Holiday she learns new meanings to the word “pack” and the alpha role.